A delicious way to get your Omega 3 fatty acids! Preparing fish can be tricky. Cook it for too long and it dries out, not long enough and the center is undercooked. Fine if you are eating sushi, but not so much when you have a beautiful fillet that sets you back $20 plus! 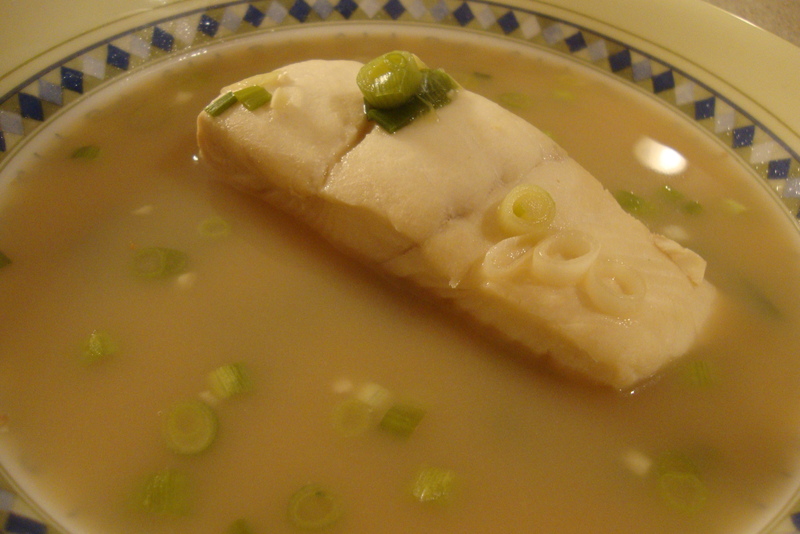 I’ve gotten better at preparing fish, but I have found that poaching is a pretty fail-safe bet. With poaching, it is nearly impossible to over-cook the fish. It always seems to come out tender and flaky. Alex and I try to eat fish at least once a week. It is so good for you! Fish protein is easily assimilated by the body; great for all you athletes. It’s best to get your Omega-3 fatty acids through whole foods and fish fits the bill perfectly. Omega-3 fatty acids have been shown to provide the following benefits: decreased risk of heart disease, lower chance of developing certain cancers (selenium found in fish also helps decrease cancer risk), improved mood, decreased systemic inflammation, and better looking skin – bonus! New research is showing that supplementing with isolated fish oil may not be as beneficial as the whole foods sources and may even be harmful. Please see Chris Kresser’s article at The Healthy Skeptic for more details. In a large saute pan, combine ingredients from chicken stock through fish sauce. Place the halibut into the stock mixture. Start heating the saute pan slowly, medium-low heat. Bring to a simmer and cover. Poach the fish for 15 minutes, checking to make sure you are not boiling it. After 15 minutes, stir in the scallions and coconut milk. Simmer for 5 more minutes. Taste for seasoning. I found no salt was needed as the soy sauce and fish sauce provide a decent amount of flavor. Using a large or fish spatula, place the fish into bowls. Discard the lemongrass stalks. Divide the broth mixture among the bowls and serve immediately. Coconut milk, Garlic, Ginger, Halibut, Lemongrass, Scallions, Stock. Bookmark.